Untitled: 4 panels, multi-colored aquatint and spit bite on Hahnemühle Museum Etching 450 gsm. Edition of 30 (projected). Each panel: 81 ¼ x 45 ¼ inches (205.74 x 114.3 cm). Published by Gemini G.E.L. 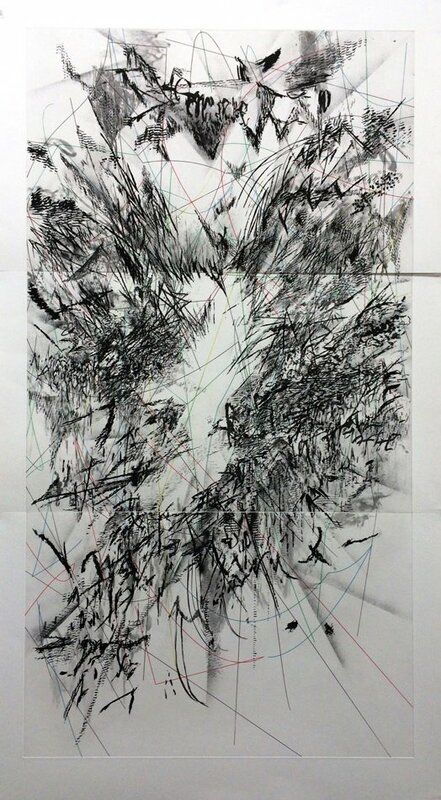 LLC, Los Angeles; Courtesy of Marian Goodman Gallery, New York / Paris, © 2014 Julie Mehretu and Gemini G.E.L. LLC. Photo credit: Malcolm Varon. 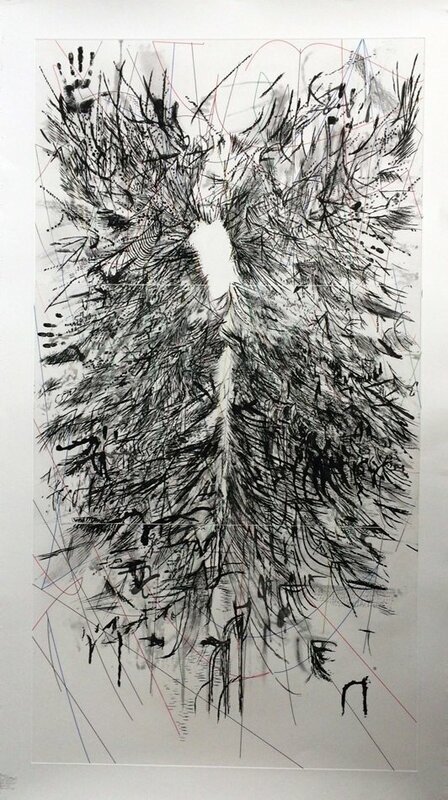 Julie Mehretu’s etchings carry a unique depth of field that makes her work reminiscent of both an aerial view of a landscape and a cross section of a fibrous being. Her works possess elements similar to those of maps, blueprints, city plans, mountain ranges, and dust storms. Although abstract, these works represent the happenings of the human race. The marks act as individuals who, in conjunction with points of erasure, elicit the building, destruction, and rebuilding of civilizations. 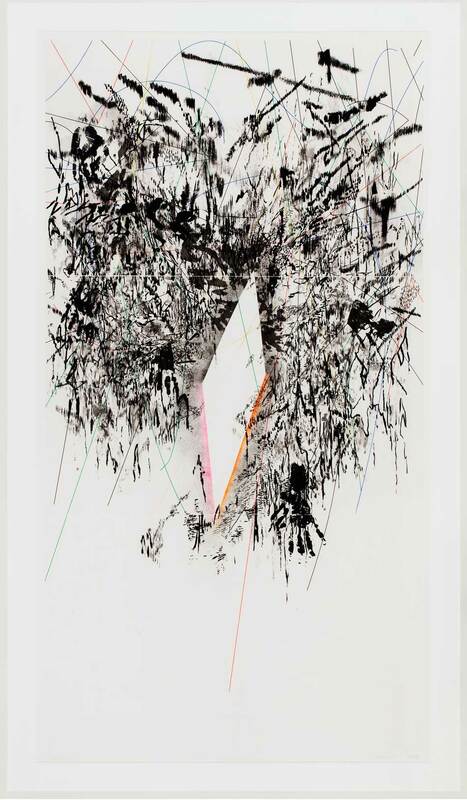 Mehretu refers to her creative process as “mark making”. Each mark on the canvas carries a different weight, size, intent, and meaning. The power of a single mark is captivating. Viewed from close proximity, the marks appear to be almost completely autonomous from each other. However, from far away the marks overlap and interact with each other to form one coherent image. Perhaps even more remarkable than mark making is the absence of marks in Mehretu’s work. Small patches and even large geometric areas of the paper are unmistakably left unmarked. Erasure and marks that were never created at all somehow become prominent. This use of negative space alters preconceptions about the medium with which she works. Mehretu chips away at the canvas with erasure, eliminating positive space like a sculptor chiseling away marble. 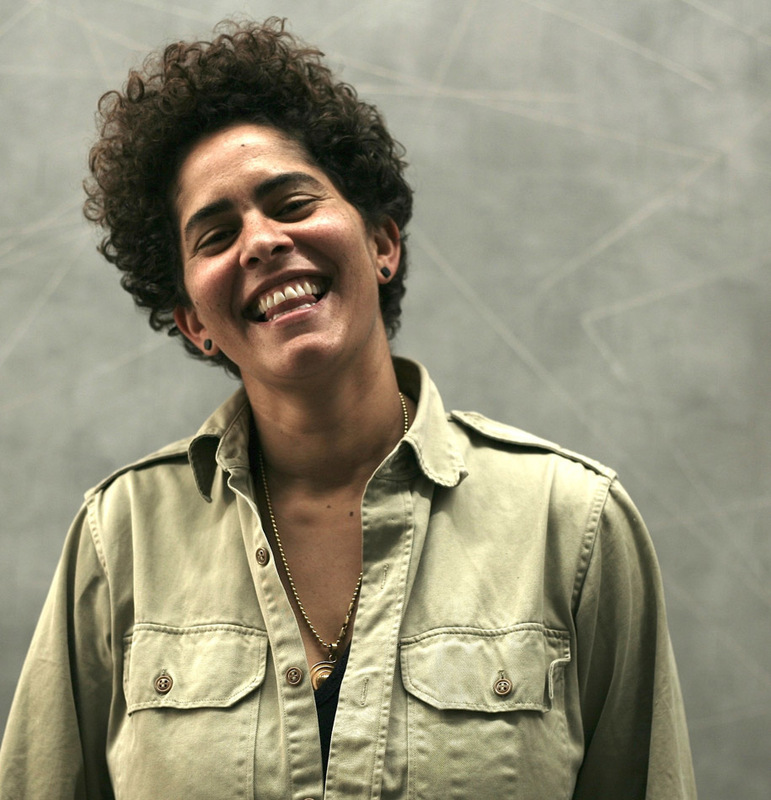 Julie Mehretu was born in Addis Ababa, Ethiopia in 1970 and lives and works in New York City. She received a Master’s of Fine Art with honors from The Rhode Island School of Design in 1997, a Bachelor’s from Kalamazoo College in 1992, and studied at University Cheik Anta Diop in Dakar, Senegal in 1990-91. Mehretu is the recipient of many awards, including a MacArthur Fellowship (2005), The American Art Award granted by The Whitney Museum of American Art (2005), the Berlin Prize: Guna S. Mundheim Fellowship at The American Academy in Berlin, Germany (2007). 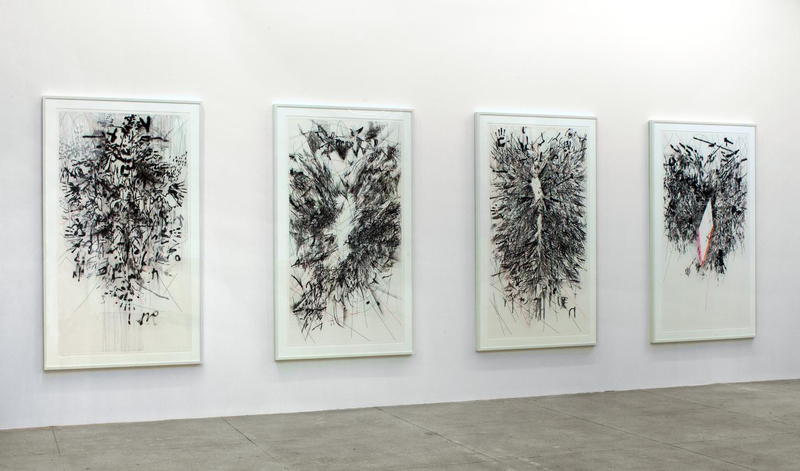 Mehretu’s recent solo museum exhibitions include Julie Mehretu: Grey Area, Deutsche Guggenheim, Berlin and Solomon R. Guggenheim Museum, New York (2009-10); Julie Mehretu: City Sitings, The Detroit Institute of Arts, Detroit (2007); Kunstverein Hannover, Hanover, Germany (2007); Louisiana Museum, Humlebaek, Denmark (2007); and Julie Mehretu: Black City, MUSAC-Museo de Arte Contemporáneo de Castilla y León, Léon, Spain (2006). She has participated in numerous international group exhibitions including the Whitney, São Paulo, Carnegie, Sydney, and Seville biennials. Most recently her work has been included in Fifth Moscow Biennale of Contemporary Art, Moscow, Russia (2013); Documenta (13), Kassel, Germany (2012); The Painting Factory, Los Angeles Museum of Contemporary Art, Los Angeles (2012); In Praise of Doubt, Punta della Dogana, Venice, Italy (2011); Picasso to Julie Mehretu: Modern Drawing in the Collection of the British Museum, British Museum, London (2010-11); and On Line: Drawing Through the Twentieth Century, Museum of Modern Art, New York (2010). 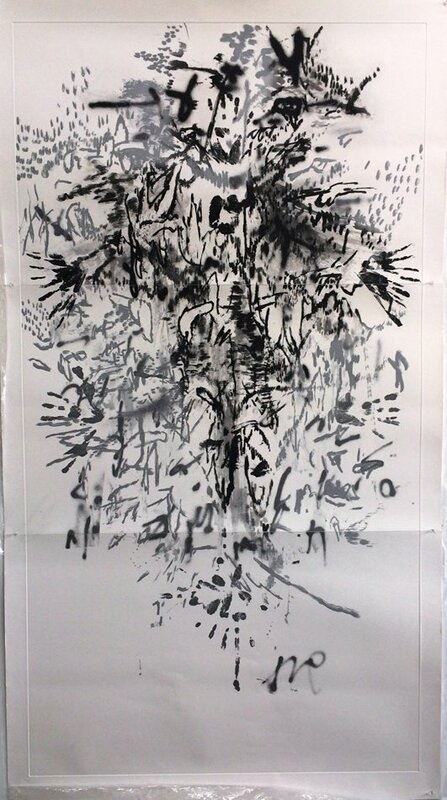 Mehretu’s work is in the permanent collections of numerous international museums including The Museum of Modern Art, New York; Tate Modern, London; San Francisco Museum of Modern Art; Walker Art Center, Minneapolis; Whitney Museum of American Art; National Gallery of Art, Smithsonian Institution, Washington D.C.; Studio Museum of Harlem; New Museum of Contemporary Art, New York; Museum of Fine Arts, Houston; High Museum, Atlanta; The Brooklyn Museum; Carnegie Museum of Art, Pittsburgh; Hammer Museum, Los Angeles; Philadelphia Art Museum; Seattle Art Museum; Des Moines Art Center; Virginia Museum of Fine Arts, Richmond; The Minneapolis Institute of Arts; Louisiana Museum of Modern Art, Humlebaek, Denmark; and Museo de Arte Contemporáneo de Castilla y León, Spain.